Two men have been jailed for a total of ten years for attempting to rob a bank with a sub-machine gun in Ealing. Yusuf Yusuf, 18 years of no fixed abode, was sentenced to seven years imprisonment, and a 17 year-old male of Acton, W3, was sentenced to three years imprisonment for attempted robbery and possession of a firearm, today at Wood Green Crown Court. Both men pleaded guilty to the offences on 6 October. "As a result of the publicity done around this case we received numerous calls that enabled us to identify the defendants and ensure an overwhelming prosecution case to which they pleaded guilty. This shows that when the public and police work together we can bring criminals to justice." At approximately 15:30hrs on Tuesday, 16 March 2010, police were called to reports of a robbery inside Lloyds TSB on The Broadway, West Ealing, W5. demands for cash. 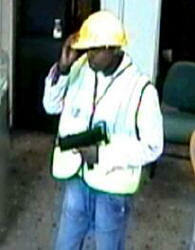 They pointed a Mac10 machine gun at front counter staff demanding that money be put into bags. The staff refused and the two men, who left empty-handed, then fled the scene on foot. No shots were fired and nobody was injured. Subsequent appeals for information and the release of CCTV images then followed, assisting the Finchley Flying Squad in the identification of both men.